My favorite time of the year is quickly approaching. Hearing little ones talk excitedly about what costume they plan to wear or how much candy they plan to get brings a huge smile to my face. I remember those days fondly. Their excitement sparks my own. What about our little ones with communication disorders? What about our kiddos who are non-verbal? What about our children with apraxia or severe phonological processing disorder? About four years ago, when my little one was still a baby on my hip, we were a family that stayed home and passed out candy. That year we saw a lot of teenagers coming to our door and none of them had on a costume. Each time my husband gave them candy but then grumbled once the door was closed about how if they could not take the time to put some effort into a costume, he didn’t see why we needed to give them candy. Later that evening, the doorbell rang again. When we opened the door we found a father holding a bag to put candy in. Next to him was his son (or at least I assumed it was his son) who appeared to be around 5-6 years old. The little boy was dressed in every day clothes and was hopping around excitedly. The little one said not a word but just hopped around and looked at our jack-o-lantern. The father was the one that said, “Trick or Treat.” We gave them candy and they left with the father saying, “Thank you.” I noticed that the father took his son’s hand and pulled him gently away from the jack-o-lantern. When the door closed my husband was even more frustrated and said, “Kids are not even dressing up or saying anything. Why do we bother?” My husband did not understand or interpret the situation appropriately. Having worked with individuals with special needs for many years, I noticed things that would suggest that the little boy may have special needs. He did not talk (possibly non-verbal). He did not make eye contact with us or his father. He jumped around the entire time (possible self-stimulation). He wore no costume and fixated on our jack-o-lantern. (possible sensory sensitivity). It was at that moment that I began to wonder how well did I prepare my students and families to embrace these opportunities to communicate, advocate, and educate during these special moments in life. As a Speech-Language Pathologist what are some things we can do? 1. SOCIAL STORIES: I love social stories and not just for our students who have a spectrum disorder. They are also wonderful tools for our students with sensory issues, cognitive impairments, and other disabilities. It prepares the student’s for what they are about to encounter. HERE is a free social story for Halloween. 2. 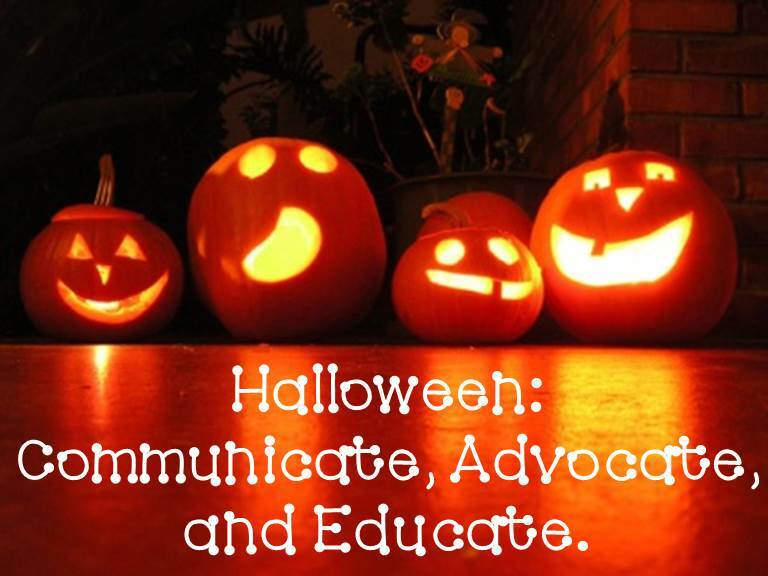 PROVIDE AUGMENTATIVE and ALTERNATIVE COMMUNICATION (AAC) SUPPORTS: If your student is non-verbal and has an aac device, be sure to program it so that they can make requests and comment while creating a jack-o-lantern, choosing a costume, and when out trick or treating. If your student is currently using low-tech aac, make sure to update their picture exchange system or communication page (or other low tech aac tool you have for them) that they utilize vie other means (i.e. pointing, eye gaze, etc..). Be sure to provide multiple opportunities to practice. 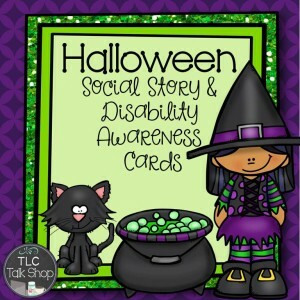 At the end of this FREEBIE, there are some cards that you can cut and laminate to have students pass out to communicate “trick or treat”, advocate for themselves, and educate their neighbors. 3. ROLE-PLAY: Simulate Halloween night by cutting out pumpkin shapes using orange construction paper and various shapes in black construction paper. Students can practice using their communication means (verbal, aac, or sign) to make requests and comment while creating a paper jack-o-lantern. It is also fun for all and provides multiple role-play situations if you speak to several specialists and teachers in your school ahead of time to simulate trick or treating (i.e. librarian, reading specialist, art teacher, music teacher, office staff, other special education teachers, etc..). You can provide the school staff that agrees to assist with stickers, pencils, and other dollar store treats (or candy). Have a schedule set so that the school staff knows which times to expect the students. After they have practiced using their speech skills, functional communication skills, or handing out the provided low tech aac in the speech room setting, take it out of the room. 4. SIMULATING SENSORY INPUT: For our friends that are overstimulated with noise and lights, you can bring some of Halloween into your speech room (if your school allows). In the past, I have put out some Halloween decorations in my rooms and I have played Halloween music for transitions. For example, when they come into my room the music may be playing and the lights are off (allowing some Halloween decorations to be lit up). When I turn on the lights and turn off the music, they are expected to sit down. When I turn the music back on they can move to the next activity or prepare to head back to class. What do you do to prepare your student’s for Halloween? 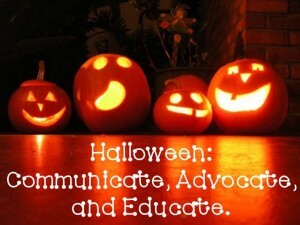 Great tips!I have taken my kids “trick or treating at the office and a few other spots. They are super excited and we get to rehearse what’s expected. So fun. I love the personal approach in this post. Thanks for the freebie and for sharing this important tips. Fantastic ideas! Thank you for these suggestions and the free download – I know many families who will love having this little book to prepare for the big night.